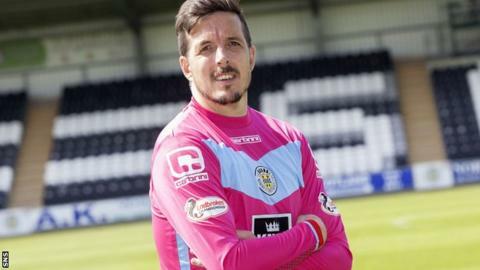 Jamie Langfield says he has joined a "vibrant club"
Jamie Langfield insists leaving Scotland's top flight to join Championship outfit St Mirren is far from a step down. The 35-year-old goalkeeper, who left Aberdeen this week after 10 years at Pittodrie, is excited about his new player-coach role with the Buddies. "People might stay it's a step down but not for me," he told BBC Scotland. "I've come to a vibrant club, my home town club, a club that I believe has got great infrastructure." Langfield intends to use his two-year deal to bring a "winning mentality" to manager Ian Murray's squad. "That's what I had at Aberdeen where it was no matter what, we just took game from game and it didn't matter how we won it," the veteran keeper added. "Hopefully I can bring that here, if it's in coaching capacity or playing." Langfield also stressed that promotion favourites Rangers and Hibernian would not experience plain sailing this season. "They won't enjoy coming to places like here, Easter Road of Queen of the South, Falkirk etc," he added. "It's not a foregone conclusion and you'll certainly not get anybody saying that from here. We want to compete, we want to be up there and we want to be doing the best for the team as a club like this deserves to be in the SPL." "It's a tough league but our aspiration is to be up top half of the table competing to get promotion. "The club doesn't have finances likes of Rangers and Hibs, so they're obviously out there on top just now and people are speaking about them - but that's maybe a good thing for us, we'll quietly go about our business and then see where the season takes us. "We are a young side with bags of enthusiasm."